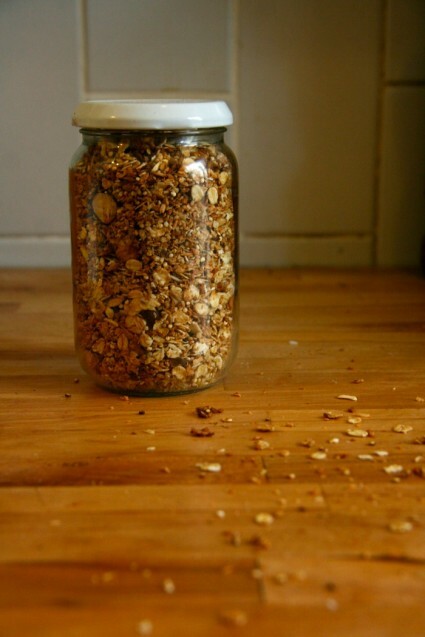 One of my favorite things to make is granola; once you get a good base down, you can pretty much add any fruit, seeds and spices that you want. It’s also one of those things that when you start making it yourself you wonder why you ever bought the pre-made version. Granted, not everyone has a lot of time to be in the kitchen, but compared to a processed bag of granola, the pay-off from your limited amount of time investment in making your own is well worth it. Plus, if you want to change the food system, there’s no better thing to do than just cook things yourself (no really, just go open up a copy of Cooked). I don’t need to really tell you about all the negative aspects of industrial, processed food do I? No, I didn’t think so. Moving on. This recipe makes getting rid of a commonly purchased item quite simple. It really is all about mixing some stuff in a bowl and baking it. But the twist is in the quinoa. Toast quinoa is a neat trick I learned last year. In fact, using toasted quinoa in breakfast dishes was all inspired by this recipe which puts it on top of yogurt (hint: delicious). Making it takes only a few minutes, and you get a nice crunchy texture to the quinoa that makes a good addition to a granola. Keeps it from being just a boring combination of oats and nuts so to say. 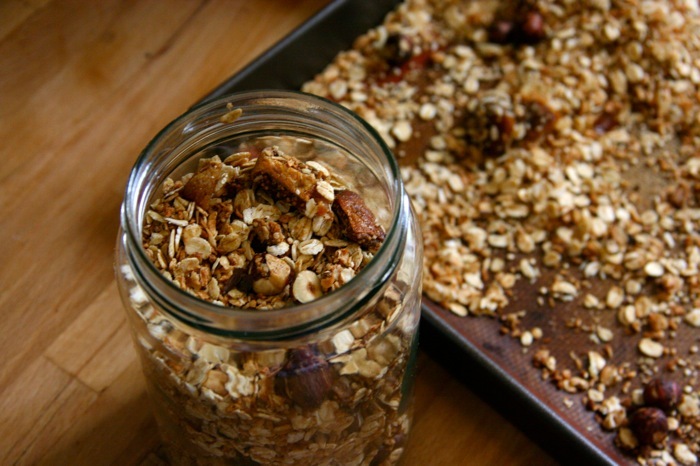 Now, to making your own granola with toasted quinoa. Enjoy. In a bowl, combine the oats, coconut, hazelnuts, figs, salt and spices. 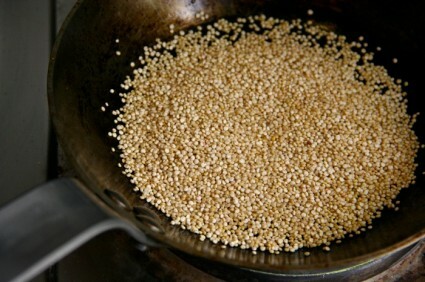 Place the quinoa in a small frying pan and toast over medium heat, constantly stirring so that it doesn’t burn. After a little bit, you’ll hear popping noises. That means the quinoa is toasted. Remove from heat and add to the bowl with the oat mixture. Stir the ingredients together until well blended. Pour olive oil and honey into a small saucepan, and slowly warm on low heat. As it warms, whisk or stir with a fork until the oil and honey are thoroughly blended together. Pour over the oats, and using a wooden fork, stir until the oats and other ingredients are evenly coated. 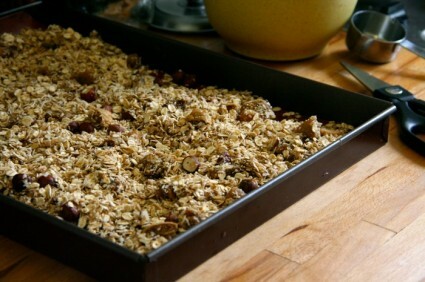 Spread out the oat mixture on a baking tray and bake at 325°F for 15 to 20 minutes. Granola should have a golden brown color to it. Remove from the oven and let cool. Once cool place into a glass jar with a lid to store. Serve with yogurt, milk, soy milk, hemp milk or whatever else you deem appropriate. It’s also good with some fresh fruit sliced on top. I always rinse my quinoa before I cook it to get the powder I’ve read about off. Is it of any concern that I would skip that step here to toast it? Thank you! Kristen – if you do that, just be sure to let it sit out to dry first. You want to toast it dry. Thank you! I always thought once it was wet it stayed that way and had to be boiled. So I should just let it air dry, correct?